The Windsor Public Library Board has approved the new Central Library Functional Plan which administrative staff and architect Jason Grossi began in 2016. The two-phase initiative captures the vision for a new central library and includes costing estimates and the results of various community consultations. 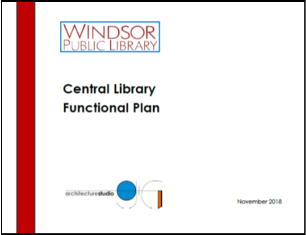 The Plan provides a road map for the Windsor Public Library Board and City Council to follow and move forward and build a new Central Library in downtown Windsor by 2026. The executive summary, background, consultation process, the plan, costing estimates and appendices can be found here. The document now goes to City Council for discussion and approval. 3 Responses to "New Central Library Functional Plan Approved"
To me, the location or even the architectural design is less important than what happens inside the new library. It’s nice to read about “quiet study areas” and sound abatement considerations in this plan. A library should have areas that are “exciting and active” and offer multi-media resources for the public, but there should also be areas that are away from the chatter of cellphones and TVs and computers where people can read and concentrate in silence. A location on the waterfront would be stellar. People could read as they look at the passing ships and the wildlife of the Great Lakes region. Nature is so very inspiring, soothing, and healing. Having a modern cafe (again, with water views) would cinch the deal. It’s great to see this moving forward. I suggest a location on University Avenue between Victoria and Janette. This stretch of University will be redesigned soon and a stunning new library would be its showpiece, right between University of Windsor and downtown.